Do you like rock? 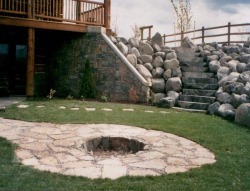 From large boulders to hand placed river rock for slope retention, we can install all sizes. If you want a few boulders for accent or a bed with decorative colored rock, we do all shapes and sizes. Real Flagstone, Basalt , Granite, or Concrete Stainable steps are installed for mobility and beauty.